Rhianydd, 18, is a volunteer with the SAFE project and has been volunteering since 2017. ‘I first heard about Volunteering Matters at a roadshow. I was not involved in any extracurricular activates at this point as I didn’t feel very confident, but I completed the application form, and the Volunteer Manager was very supportive. I didn’t feel qualified enough to go into part time work after my GCSEs, and I was also concerned that I would lose focus on my studies in college. I felt that volunteering would help me stand out when I eventually do look for employment, though I was still nervous since I wanted to do my best. I have autism but this wasn’t an issue, as I didn’t feel there were any barriers in my way – I need things to be clear and simple and the SAFE project seemed a worthwhile project that could make a difference. It will also give me skills and experience that I can put on my CV. I think I am a good candidate to volunteer on this project for those with learning disabilities – as another disabled person I am their peer and they engage with me as I understand. I was quite nervous about talking in front of people, I didn’t really know what to expect, but it’s been really good and we have had fun. I also helped my Volunteer Manager make a video on young person’s rights, and spoke about disabled people’s rights to a sexual life, as there is a lot of stigma around this. 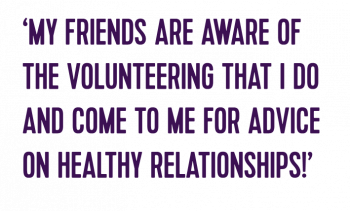 I have learnt a lot also, and my friends are aware of the volunteering that I do and come to me for advice on healthy relationships! The team with Volunteering Matters are a wonderful bunch to work with and helped me gain more confidence. I wouldn’t change a thing about my time here, I’ve had so much fun! Now I hope that I can keep volunteering and helping out whenever I can’.